Few documents express an era and an overlap of cultures in the way that the present text does. It is based in the Arabic Medicine of the Middle Ages, but is in Chinese even if including short descriptions in Arabic script. It also, as will be evident below, is a text that is not just purely Arabic Medicine but one in which Arabic Medicine has become assimilated to a Chinese environment which itself is already assimilated. Our present text is also in its medicinals and formulae indicative of a massively-extended environment in which all kinds of medicinals were traded and used over expansive spaces and associated with complex networks focused over land and sea. Above all, the Huihui yaofang (HHYF), “Muslim Medicinal Recipes,” or perhaps better, medicinal recipes of “western medicine,” as will be seen from a detailed analysis of its contents had best be thought of as a product of the Mongol Age even if the present text is Ming. The Mongol era was a time of unprecedented cultural exchange, we have only to remember figures such as Marco Polo and Rabban Sauma, who went the other way, to Europe, to gain a grasp of what went on. The name HHYF now applies to the 15% that survives of a once 3200 page Arabic-medicine hospital manual of a type known from Cairo, for example, and other places in the Islamic medical world. It was compiled in its present form between 1398 and 1408 but certainly based upon a version from the Mongol Yuan 元 Dynasty that is probably to be associated with a Syrian medical family resident in China. The text itself may have been based on a translation of a Persian-language work, or several such texts, although the present HHYF shows an effort to integrate Chinese and Arabic medical ideas and is much more than just a translation. Whoever was involved, they probably included not only Syrians but Turkic-speakers as is shown by the forms of the Chinese transcriptions of words and terms added tp the Arabic-script entries. The original work was in 36 chapters (juan 卷) plus two tables of contents of which three content chapters (juan 12, 30, 34) survive along with the table of contents for the second half of the encyclopedia. This means, that with juan 12 from the first part we have precise details about the contents of more than half the book (in this case 20 juan). Internal cross-references provide addition indications of what there once was, including a separate, detailed discussion of specific materia medica and a discussion of the types of doses called from in the text. Each of the three content chapters is organized around one or more disease categories. The largest is the detailed discussion of “wind” (feng 風 or feng 瘋) ailments, a completely Chinese concept but transferrable, with various subcategories. It occupies all of juan 12, Similar is the section on “various symptoms,” which occupies all juan 30. By contrast, Juan 34 is comprised of shorter discussions of wounds from metal objects, of broken bones, including a highly interesting section on head wounds and skull fractures, the practice of cauterization, scalds and burns, wounds from blows, and bites, called by the text the most dangerous kind of wound since the mouth is so dirty. Supporting recipes and the accompanying theory discussions presented in the chapters are numerous quotations from the various Arabic medical authorities. These include, and this is unique for East Asia, as noted, Zhalinuxi 扎里奴思 (i.e. Galen[os]), but also, among others, Rufus of Ephesus, Paul of Aegina, Hippocrates, Aristotle, Alexander the Great, and, of course, the great purely Arabic authorities such as Ibn Sīnā whose work was increasingly important at about the time that the HHYF was being written and used. 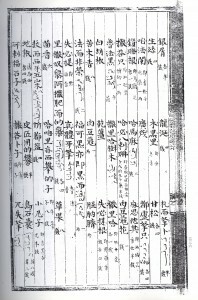 The HHYF, although in Chinese, is unique, as noted also, in its Arabic-script entries for the names of medicinals and for key terminology. These are not just given in Arabic-script but are also provided in Chinese transliteration entries as read by informants, in this case, judging by the pronunciation employed for primarily Persian-language texts, Turkic informants with a heavily palatalized pronunciation of the original standard Persian and Arabic. Dieser Eintrag wurde veröffentlicht in Research von . Permanenter Link des Eintrags.